If you want a crossover SUV, our team at Hyundai of Somerset suggests that you check out the Santa Fe. The new Hyundai Santa Fe is a family-oriented vehicle that is always popular among consumers because it offers ample protection through many innovative safety features. The new Santa Fe comes with the Safe Exit Assist System as a standard safety feature. This feature enhances the safety of your passengers by using the Safe Exit Assist radar to detect for vehicles that are approaching from the rear. If a passenger tries to open the door when a vehicle is approaching, your passenger will be given a visual and audible alert. Rear Occupant Alert is an optional feature that is included with the Santa Fe. 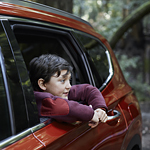 This feature monitors for children and pets in the rear and will send a reminder for drivers to check for valuable cargo in the back before they exit. When a driver has left and locked the vehicle, and the system detects motion in the back seat, the horn will sound and the driver will be issued an alert on his or her smartphone via the Blue Link connected car system.